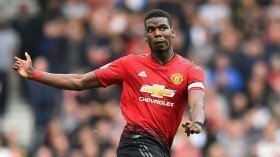 Juventus sporting director Fabio Paratici has said that it would be difficult to lure Paul Pogba from Manchester United when the season comes to a close. The France international was touted for a probable return to Turin earlier in the season amid his average run of form under ex-United boss Jose Mourinho. However, his fortunes have transformed with the appointment of Ole Gunnar Solskjaer on an interim role and he is currently the best performing midfielder across the Europe's top-five leagues in 2019. Amidst this, Paratici has admitted that it would be very difficult to lure the Frenchman back to the Serie A holders, he told Gazzetta dello Sport: "Will Pogba return to Juventus? No. In football, you never know, but I think it is very difficult." Pogba is expected to feature for Manchester United this evening where they are scheduled to host Paris Saint-Germain in the first leg of the Champions League round of 16.